The University is delighted to host Satish Kumar on the 22nd April and welcomes members of our local community to join us for an exciting and interesting evening. Born in 1936, Satish became a Jain Monk at the age of nine and then, at the age of eighteen, joined the Gandhian non-violent land reform movement. In 1964, his 8,000-mile Peace Walk took him from Delhi to all the nuclear capitals of the world, without a penny in his pocket, carrying only a message of peace. He later settled in the UK and went on to become Editor of Resurgence Magazine, championing ecology, art and spirituality. He founded the world’s leading college for activists and change-makers, Schumacher College, now celebrating its 25th anniversary. As a result of his teaching and writing Satish has changed countless lives. He has given two TED Talks (Whitechapel and Exeter), been the subject of a BBC documentary and featured on Desert Island Discs. Satish is a speaker who shines with debate and challenge. He is now entering his 79th year and at the peak of his powers and learning. 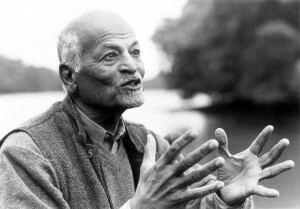 Satish Kumar is one of the greatest thinkers and doers of our age. He combines a rare kind of personal energy with a fearsome intellect and a deeply philosophical perspective with the kind of real world pragmatism necessary for achieving real change. His relentless optimism is infectious and has helped many people to excel and exceed when they might otherwise have given up and failed. His contribution has been and continues to be immense”. 2016 is a special year for Satish with his 80th birthday, the 50th anniversary of the Resurgence magazine and the 25th year of Schumacher College. In the autumn, a special collection of DVDs to celebrate Satish’s life and work will be released, where Satish is interviewed by Jane Davidson, Associate Pro Vice-Chancellor here at UWTSD, former Minister for Environment and Sustainability in Wales and the woman behind the radical One Planet One Wales initiative. On 22nd April, Jane will welcome Satish to the university to explore one of the key trinities which have influenced his life’s work, ‘Soil, Soul and Society’ looking at issues of ecology, economy, spirituality, education, business, optimism and activism – and letting you have your say.